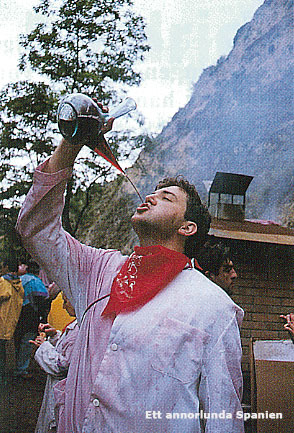 If you would like to participate in a real wet Spanish "fiesta" you should try to go to Haro, La Rioja, 29th of June in the morning. At that date a procession takes place in the streets of the town. At the head is the mayor on horseback with a banner and following him are the citizens of Haro, all dressed in white with red scarfs. They are carrying jugs, bottles, carboys and what ever you can fill with wine. Al ages are participating but the youngsters dominate. They walk or drive to a mountain with a chapel short distances away, where a mass is held. 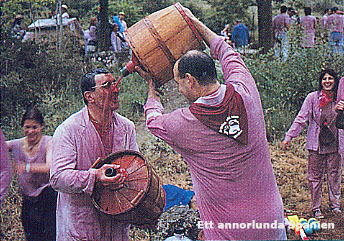 After the mass "hell" breaks out... Everybody sprinkles wine on each other. The carriers of some sprinkle equipment literally heaps wine on their prey, but that is considered cheating. You have to use botas, the bottles made of leather. Soon all people have turned pinkish, their hair hangs down and their shoes are soaked. But everybody looks very happy, especially they who are making bonfires and arranging with wine and tapas. 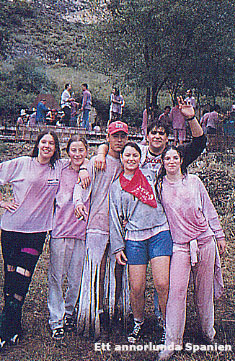 Back in Haro all people gathers together at the bullring, and the youth can show if they are agile and brave. In comes one savage heifer after another and hunts down everything they see. If you are brave you wait for the right moment and jump over the heifer just when she is ready to gore. A way to risk life and limb. 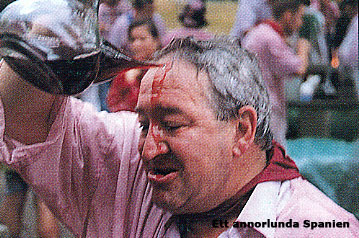 The history behind the wine battle, the end of the "fiesta" in Haro which lasts for one week, is an ancient dispute over land. If you decide to visit the wine battle, why not arrive a few days earlier. Enjoy the beautiful surroundings, the monasteries, the "fiesta" and the bodegas. One of the more genuine bodegas is La Muga owned by the Muga family. The bodega makes quality wine the craftsmanlike way with its own hoopery. If you are lucky you may be guided by one of the family members and invited to their tapas corner for some delicious tapas and wine-tasting of Mugas wine. Sr. Muga with the "porro"